The Mountain Plumbing Lead Free MT1103 Point of Use Drinking Faucet is a cold water dispenser. This faucet can be used in many applications such as food prep, bar prep, and with a water filtration system. It is available in multiple finishes which allows you to find the perfect design for your bar, kitchen, or even bathroom. * While the brass compression fitting provided with this faucet will work with plastic tubing, we suggest upgrading to a plastic faucet connector. This inexpensive part will provide a more efficient leak-proof connection. For 1/4" OD plastic tubing you would use a 1/4" faucet connector for 3/8" OD tubing you would use a 3/8" faucet connector. ** Each of these beautiful and unique faucets is created and produced for you and your home. 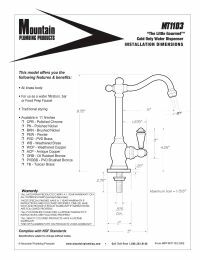 Mountain Plumbing takes time to craft, produce, and perfect these faucets to your specifications and finish requirements. Please be advised that there may be an extended delivery window time-frame for any of these faucets. We are sure that you will be pleased with these faucets and accessories. Because of the unique nature of these items, they cannot be returned once they have been ordered or produced. Should you cancel the production of your Mountain Plumbing faucet or accessory after the order has been placed, there will be a non-refundable 25% order cancellation fee based on the price of the item being cancelled. This fee cannot be used for other purchases. To avoid these fees, please feel free to call us prior to placing your order if you have questions about the products or finishes at 1-877-335-3339.